Through universal design, we can certainly better accommodate visitors with disabilities, but the real benefit of universal design is that it allows for engagement of the whole community. The Norwegian Association of Disabled (NAD) uses universal design as a powerful tool to create a harmonious environment meeting the needs of all people, regardless of disability. Within the field of architecture, universal design refers to a people-centered approach focusing on creating an increasingly better fit between the human user, architecture and the built environment – allowing for the creation of functional spaces in which all people feel a welcoming sense of belonging, regardless of individual differences such as age, size or abilities. As flooring often makes up the largest surface of a building, it plays a major role in creating universally designed spaces that provide a comfortable environment for all. How do we design spaces so that the flooring enriches the building rather than becoming an obstacle for the young mother with a pram, the blind person or the elderly – and all people in between? The Norwegian Association of Disabled is an advocacy organisation of people with disabilities. Their vision is of a society where people with disabilities have the same opportunities as other people to live according to their wishes, abilities and interests. It is therefore especially important for NAD to provide their employees and visitors with a universally designed office built with materials that accommodate everyone, regardless of disability. Apart from the functional aspect, NAD had several aesthetic requirements and wanted to eliminate the risks of their office being perceived as ‘institutional’, aiming for a well designed building where the interplay between light, colour, indoor air quality, accessibility and acoustics together create a space where you’d instantly feel good, regardless of who you are. 1. DURABLE FLOORING THAT IS EASY TO ROLL ON. NAD were in need of a flooring that could withstand any pressure exerted by wheelchairs and mobility scooters. As BOLON’s material is durable, firm and not prone to buckling or bunching, the chosen flooring solution would provide a surface that wheelchairs and mobility scooters could easily roll on. “For this particular project, it was of especial importance that the flooring would accommodate for wheelchairs, as many wheelchair users work or frequently visit the building. With BOLON, we managed to find a flooring solution that possessed this quality but simultaneously provided a textile feeling”, says Elin Vang Kristiansen. 2. THE PRACTICAL ADVANTAGES OF WOVEN VINYL, YET A TEXTILE FEELING. The textile feel that BOLON provides is also a reason for NAD choosing BOLON, as the flooring is not only aesthetically pleasing but also functional since the matte finish contributes to minimum glare from windows and lightning within the building. Ceramic flooring, as an example, can cause glare and visual confusion for people with low-vision impairments whereas light coloured carpeting with a matte finish, increases light without increasing glare. From an aesthetic perspective, the textile character of the woven vinyl contributes to a welcoming environment that is both accessible and beautiful. 3. VISUAL GUIDELINES IN SOLID, CHANGING COLORS. Many people, especially among the elderly, take cues from the floor. As a result, facilities may usefully apply color patterns to help guide visitors through a building, with changing colors to indicate and define different areas and spaces. 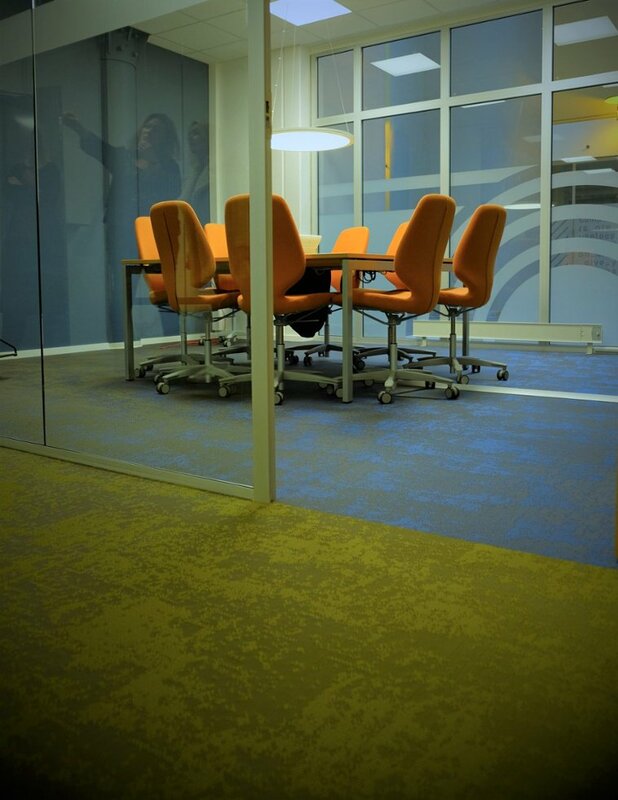 For this reason, NAD chose to use the colors, contrasts and different patterns of the BOLON flooring. “The deliberately chosen patterns in the corridor don’t have a large pattern, as some people with impaired vision would experience it as disturbing. It is also a requirement that patterns in corridors that may seem misleading are to be avoided, according to the Norwegian construction regulations”, says Elin. 4. ACOUSTIC FLOORING CONTROLS THE ACOUSTICS OF THE SPACE. 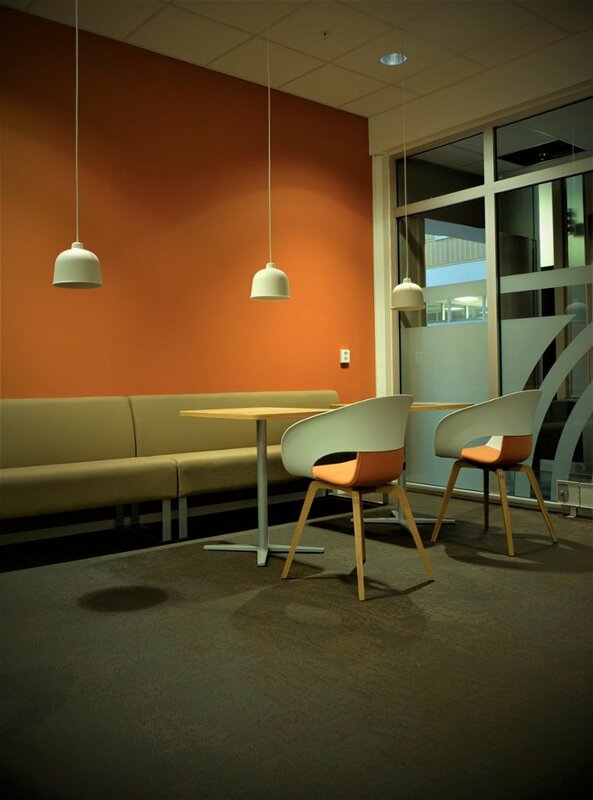 As explained in the blog post ‘How Acoustic Flooring Improves Your Space’, acoustic flooring is an important feature in a public building as it prevents the transmission of sound disturbances. 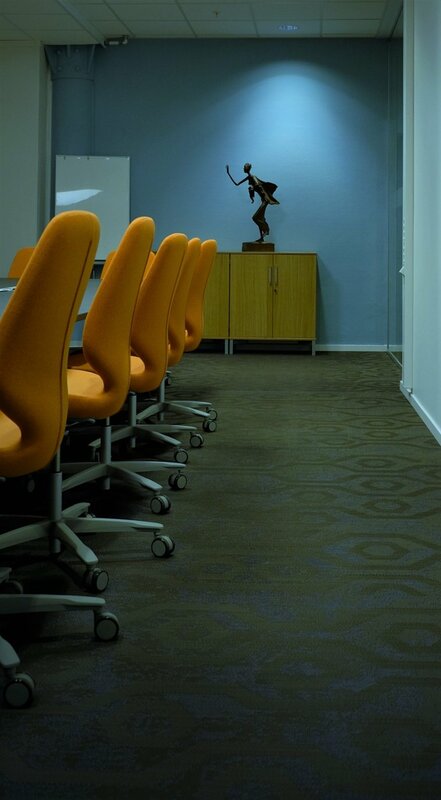 In a public building, such as a library or an office, reduced footstep noise can be of significant importance. Elin Vang Kristiansen recognised the need of reduced footstep but desired a flooring that wouldn’t completely leave out sounds, as she wanted the employees to be able to hear if people were on their way to walk into your office. “By using BOLON, we found a material that only reduced footstep noise without excluding sounds completely. This is important since it makes it possible to tell if people are walking in the corridor outside of the office. The fact that we managed to meet the acoustic requirements of the building was a big advantage of BOLON’s flooring”, says Elin Vang Kristiansen. 5. A FLOORING THAT TOLERATES WATER, IS HYGIENIC, EASY TO CLEAN AND DOESN’T REQUIRE HARSH CHEMICALS. A flooring that is hygienic, easy to clean and doesn’t require any harsh chemicals in the cleaning process is not only a more sustainable choice for the environment but also contributes to a greater indoor air quality as people in the building won’t have to breathe harsh, toxic chemicals. This is particularly helpful for the great proportion of the population who suffer from asthma and different kinds of allergies. For NAD in particular, an easy-to-clean-flooring that wouldn’t absorb any of the dirt or sand that wheelchairs bring in was a must. “Now the flooring has been used in the office for a little more than a year but it looks as nicely as it did from the beginning. It is convenient that we can use the same flooring in the kitchen and the office and we also have a lot of plants in the building so it feels safe knowing that the flooring tolerates water”, Elin concludes. Kai Gustavsen from the Norwegian Asthma and Allergy Association, NAAF, agrees. He also claims that from a health, environmental and safety perspective, in Norway referred to HMS, BOLON fills all criterias. “It is sustainable to choose BOLON, both from a health, environmental and safety perspective”, states Gustavsen. He means that from a healthy perspective, BOLON contributes positively to indoor air quality, and he therefore recommends BOLON both in respect to those diagnosed with asthma, allergies and other types of hypersensitivity but also for non-allergic people, as the BOLON flooring doesn’t allow the accumulation of allergy-causing substances that trigger asthma. 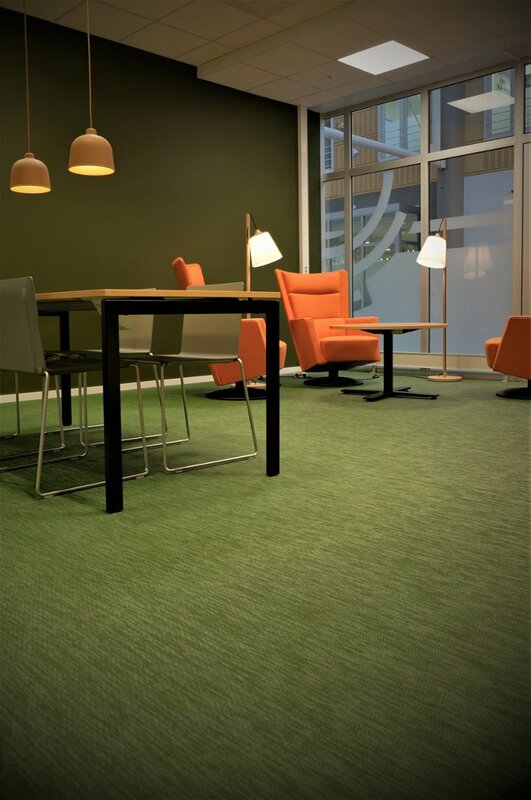 From en environmental perspective, apart from certified by certifications like BREEAM and ECO-product, BOLON’s flooring is completely free from phthalates. Lastly, BOLON is a safe alternative due to the cleaning aspect since there is no need to impregnate the flooring or treat it with any chemical products – only warm water (tolerates up to 100 degrees) and occasionally soap and the use of a regular flooring machine. Contrary to what many people may assume – universally designed buildings that are accessible to everyone, including those with disabilities, don’t equal dull and boring architectural design. The Norwegian Association of Disabled (NAD) installed BOLON flooring to provide universal and accessible spaces that are both functional and useful, yet tasteful and aesthetically pleasing.